« From where she lived when she was a child, my Mistress has retained the habit of decorating everything for Christmas (*). And today she has installed everything, except the Christmas tree, of course, which will come to our place beginning of next week, probably. It was chilly but for nothing in the world she would have avoided this pleasure of installing lights on the small fir trees, in my garden, and in front of the window of the house. RouXy? 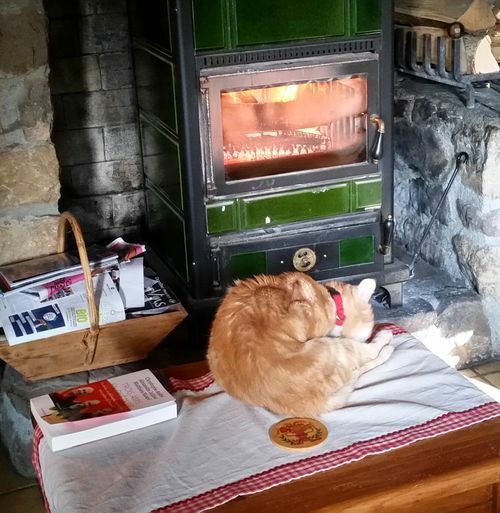 My friend spent a lot of time inside, even if that was not all day in front of the stove. Of course Frimousse didn’t know it would be RouXy’s last Christmas, and his last Christmas too. No biscuits for the time being. And no decoration yet. We are not in a Christmas mood. You can guess why. The last Christmas before the civil war ? This entry was posted in Non classé and tagged biscuits, Chrismas, decoration on 6 December 2018 by Le Maitre de Frimousse. yes it is hard to be in a Christmas mood! One small antidote is many hours in front of a warm fire! We celebrate Christmas here at home every second years – alternatively with my daughter-in-law’s parents’ home. We will be fourteen for the meal, like two years ago. But two years ago, in the house, there were two kitties, and the children enjoyed playing with them. Do you cry easily ? Timmy Tomcat on Do you cry easily ? Le Maitre de Frimousse on Do you cry easily ?